I was thinking last night how I needed to write a post about Autumn just so I can remember how sweet it has been having her as my youngest baby these past three (nearly four) years now. Her loving kindness has saved me many times over. She has been a girl of few words until recently, but she communicates very effectively through physical affection. A hug from her is never just a hug. It is a gift of true affection. Last night, Steve told Autumn, "You're my girl!" and Autumn responded with, "No, SHE'S my girl!" pointing to me! Then today, as we were getting out of the car at the farmer's market, Autumn jumped from the car into my open arms and hugged me tight for a minute or so with her arms wrapped around my neck. I asked, "What's a heart?" I turned around to see what she meant. 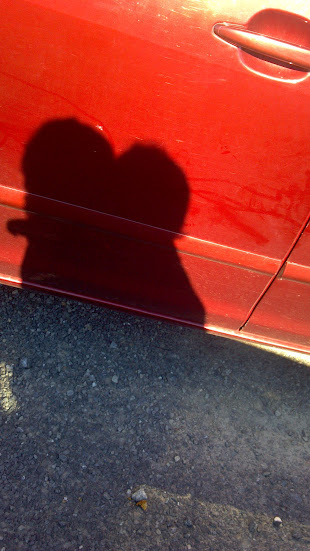 Our shadows together were forming a heart on the side of the car next to us. I grabbed my phone to take a picture of our images in the shape of a heart. Autumn starts preschool in the fall, and I want to always remember what a balm her love has been to me. Poetry in action, that's wee autumn! Thanks, Mom! We got the book today, thank you for your sweet comments. Loved them and we love you! She has the sweetest way with words. Mommies and daughters really do make hearts! That is so sweet!!! I have an affectionate four year old, and I LOVE that! All that wonderful cuddling and love. The heart picture is the icing on the cake. =) Thanks for sharing!